Gluten Free Bread Making with Genuine Flexible Dough... Gluten Free Cottage Bread Mix is ideally suited to home and commercial ovens. It may also produce reasonable results in home bread machines. 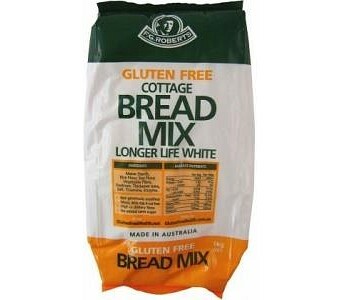 It's the perfect gluten free mix for high-top loaves, vienna style loaves, pizza bases, baguettes, rolls and buns. FG Roberts Cottage Bread Mix is gluten free, dairy free, nut free, egg free, potato free, sesame free, high in fibre, low in fat, has no added cane sugar and is Kosher and Halal certified. And you have the confidence in knowing that like all FG Roberts products, it's made in Australia. Ingredients: maize starch, rice flour, soy flour, vegetable fibre, dextrose, vegetable gum (464), salt, enzymes.